Every Legendary game requires some Legendary Factions for players to join or to oppose and you do not have time to come up with them all. 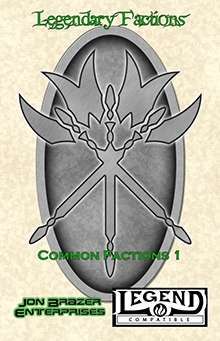 Legendary Factions: Common Factions 1 bring you 5 fully fleshed out factions that you can use in your game. These factions, initially posted free on JonBrazer.com are bundled up together for easy reference for your and your players. Each include plothooks for game masters and ideas for characters to help make ideal charcters. It also includes a new animal, spell and heroic ability. Grab these Factions today and make your game Legendary.